"A quick and easy spread for finger sandwiches. It's light, too. It's great in stuffed celery or small finger sandwiches on white, sourdough or pumpernickel bread. I add a small, thin slice of stuffed olive in the center of sandwiches for a garnish." Place pimento cheese, cottage cheese, and sweet pickle relish in a blender and blend until smooth. Keep cheese in a closed plastic container until ready to use. 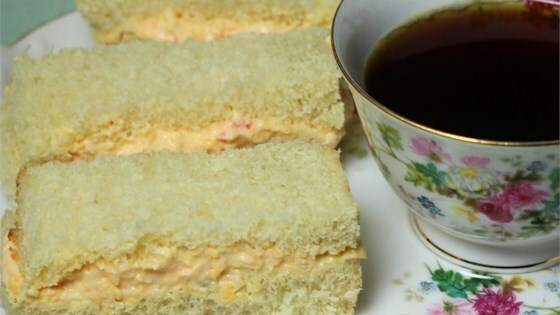 See how to make a creamy, slightly spicy pimento cheese spread. I did not care for this recipe. Was looking for a spin on an old favorite...homemade.